Over 150 vendor stands will be set up at the Fall for the Arts Festival for shoppers to browse through. 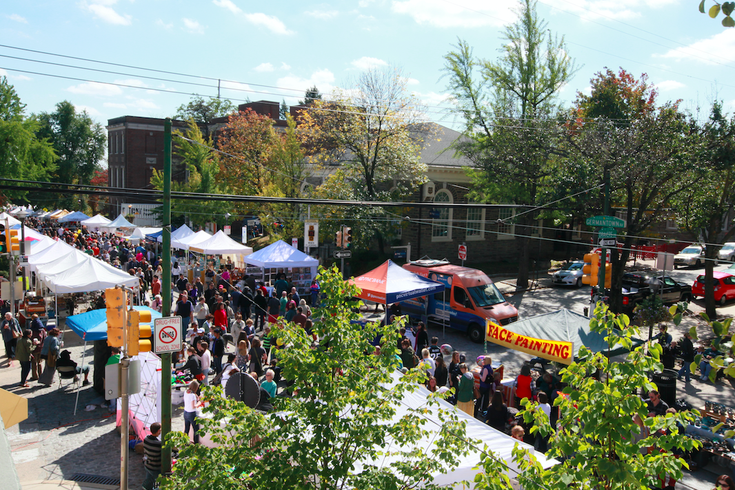 On Sunday, Sept. 30, a portion of Germantown Avenue in Chestnut Hill will be closed off to traffic for the 2018 Fall for the Arts Festival. Every year, the festival welcomes thousands of art fans to browse and shop the 150-plus artists booths lining the street. Watercolors, sculptures, pottery, wood crafts, photographs, jewelry and more will be on display. In addition, the "Makers Village" will be back, where visitors can watch art-making demonstrations. The fall event will also include live music, outdoor dining and a children's amusement park. Admission to Fall for the Arts is free. If it rains, the festival will be rescheduled for Sunday, Oct. 7.